The sheer number of movies and TV shows that followed this template is daunting. To use the term "ubiquitous" would be an understatement. But the formula works and is rather simple: Man-made disaster plus recognisable yet mildly creepy animal equals a sixty-foot tall reversal of the food chain and box-office success. But what if the horrible monster created by unfeeling and wasteful mankind was, say two inches tall? Would the theatrical President of the United States call out the military or seek out the female scientist (who is a bit too attractive to be a scientist in real life) to solve the unsolvable? Would anyone really care? If the spider that is normally, say...1/2 inch high were to mutate into a fearsome 3/4 inch high, it is likely that the heroine would have to save mankind with a rolled up Sunday paper and no one would ever know the difference. In fact, would anyone suspect that there was ever a monster or mutation at all? We have all seen big, creepy spiders and--if we saw one just a little bit bigger or mildly creepier, we would likely think that this was just another big spider in the normal context of the realm of spider-dom. But if the spider were just a little larger than average no one would get scared--which is, after all, the whole point of the exercise. Fast forward to today. Global Warming is the big, sixty-foot tall monster that has been created by bad and evil mankind. It is going to eat us all unless the President calls out the Army and good-looking scientists get free reign to solve the problem...whatever the cost. Mother nature has innocently walked through the exhaust emissions of our SUVs and coughed-up a disaster of unimaginable proportions.....right? The problem is that, just like there are big spiders and little ones, the Earth has been at times a very warm place and at other times it has been a pretty cold one. Even the most aggressive and extremist prognostications by green-tinted socialists projects a scenario that is within the normal range of Earthy temperature fluctuations. 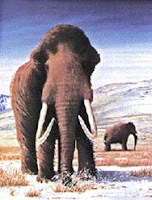 The Earth has been warm enough for Greenland to be very green indeed, for grapes to grow well in England at one point, and for Mammoths to roam the Siberian plains which are now frozen tundra. In addition, good 'ol Mother Earth has been so chilly at times that glaciers covered huge swaths of the landmass and the sea-levels were so low that early man inhabited caves now submerged dozens of feet below current sea-level. These types of climactic shifting are the norm for our dear planet. Sometimes the changes happened rather swiftly, indeed. And these are just the examples at the extremes. Science and history provide us with evidence of hundreds if not thousands of lesser fluctuations in average climate. Even these lesser climactic oscillations were on the order of dozens of average degrees--still a multiple of what the fringe Global Warming pundits conjure in their nightmares. So this means that even if we were to turn off all "green-house gas emissions" tomorrow, the Earth may warm up anyway--and could go even hotter just to spite us. It also means that such an extreme warming (and by extreme I mean the most dire Global Warming prediction of 5 or 6 degrees) is not even a blip on the Earthly scale. This spider--even in its worst-case--is only a little bit bigger than the one uncle John squashed for Aunt Martha on the back porch. Statisticians call this gap a standard deviation. In other words, the range that is normally expected to occur in a dynamic system. For example, when the weather man says that the "normal" temperature for the day is, say 90 degrees, what he is really saying is that the "average" temperature is 90 degrees--sometimes it's hotter and sometimes it's colder. In fact, it is rare that the actual temperature on any given day is the average temperature because MOST times it is either a little hotter or a little colder. As long as the temperature is within it's standard deviation, nobody should be surprised at all. Well, welcome to Global Warming folks. Even the absolute worst sky-is-falling-chicken-little-scenarios of the Eco-tyranny Movement fall well within the standard deviations of good 'ol regular climate. In fact, it leaves one wondering whether Mother Earth has even noticed that 1/2 half of us drive cars a bit bigger than we really need. It might also be worth noting that, according to the Earth Sciences, Earth at one time had an atmosphere that consisted ONLY of so-called "green-house gasses" (CO2, methane, and ammonia) and that this was the cradle of life. But I digress. Suffice it to say that, since all of the temperature forecasts are in the"normal-range" and the Climate could randomly decide to go all "warm" or "cold" on us at any time without consulting Greenpeace or Al Gore, is there really anything that we can or should do about it? The truth is that, even if there is a monster, it is only about 1/2" inch tall and it would be better to leave the President alone (he has a bunch of other issues to attend to). 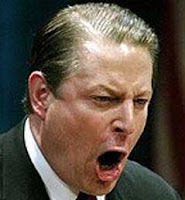 It may be more productive to whack Al Gore with a rolled up newspaper and call the issue done. I'm not saying that we should ignore important issues. Far from it. But it is vital that we keep our perspective. If we were to adopt the positions and policies advocated by the Global Warming proponents, the world would sacrifice trillions of dollars in real value and productivity to effect a world-wide average temperature correction of +/- 3 degrees centigrade one hundred years from now in the off-chance that Mother Nature will not decide differently. Mother Nature (in the form of sun spot activity, water vapor, volcanic activity, plant growth, etc.) can--and often does--toss up changes to climate trends. It's not that she is trying to mess around with us, it's more like she is unaware that we are even here at all. Actually, Mother Nature has no conscience or reason--she just is. So, to sum up: It will be difficult to determine how much change--if indeed there is any--is associated with CO2 emissions because Mother Nature plays a shell game with the climate on a regular basis and--even if the climate were not a moving target--the amount of temperature change impact would be indistinguishable from normal temperature fluctuations. Everything else is just scary music and theatrics. It may sell movie tickets, but you do not set economic and environmental policy based upon a movie....Do you?